On our guided town hall tour on 18 December 2015 our assistants for leisure management experienced one of our local tourist attractions. 642 rooms – more than Buckingham Palace, furnished and decorated in its original style – our town hall is a must-see for tourists. 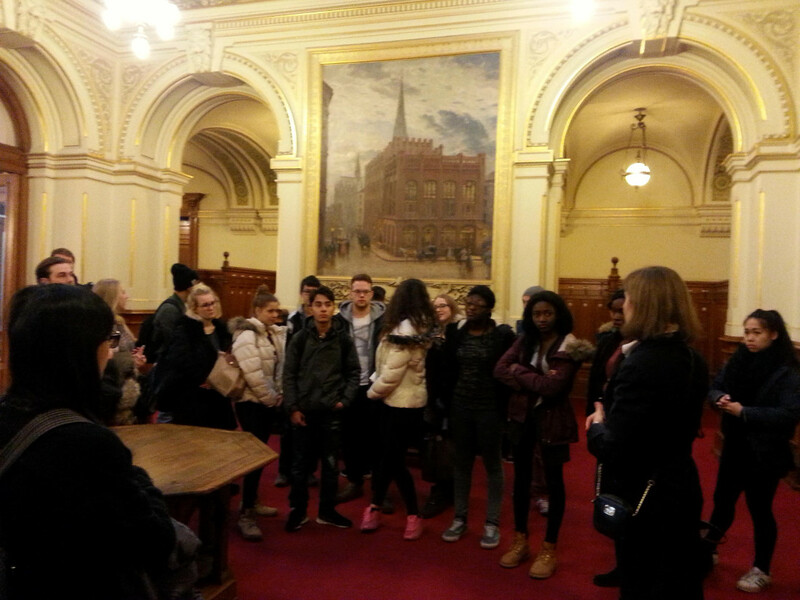 Our English-speaking tour guide took us on an interesting tour around the building and we could combine our theoretical background knowledge with the practical use of guiding language. Planned and constructed by Martin Haller and other famous architects the town hall was opened in 1897. Here is the place where the Senate and the Parliament and the mayor work together. Famous guests or other celebrities sign the GOLDEN BOOK of the city or take part in the traditional “Matthiae Mahl” a dinner where around 400 guests from politicians to artists and actors are invited to celebrate in the huge event hall. In front of the building different activities take place around the year and we were able to visit the popular Christmas market afterwards.